Suburbanites and tourists, we thank you for visiting Detroit and pumping some of your hard-earned cash into the local economy. We have a request, though: Next time you’re here for a Lions game or a concert at the Fox, would you consider adding an hour onto your trip to walk around downtown to see more of what the city has to offer and why some of us are so excited about its future? We’ll even make it easy for you: Landmarked Detroit, a new iPhone app developed by Detroit Labs, can now guide users on walking tours packed with historical information and other fun facts. Will McDowell, a business analyst at Detroit Labs, came up with the idea for the app. Like Google, Detroit Labs offers its employees Lab Time, where 20 percent of the work week is dedicated to non-client “passion projects” suggested by staff. McDowell, a self-described Detroit enthusiast who also works with the nonprofit Summer in the City, wanted to offer visitors an easy way to get to the know the city he loves. There has also been an influx of people working downtown as companies like Quicken Loans and Chrysler move more of their operations to the city’s center. McDowell says Landmarked Detroit is perfect for the person who wants to check out downtown on their lunch break. “It’s meant to be a quick read, whether you’re at lunch or an event,” he says. Though the Landmarked Detroit app is available only for the iPhone at the moment, McDowell hopes there will be an Android version soon. So far, the app has been downloaded more than 800 times since it was released less than two weeks ago. If enough people express interest, Detroit Labs could take on its continued development and expansion as an official client project. 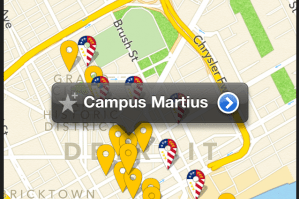 “My pie-in-the-sky hope is that the app eventually includes all of the neighborhoods in Detroit,” he adds.